For close to fifty years, helicopter support has long been a staple in transport, resupply and inspection operations for the oil and gas industries. Although a few of the industry giants have privately owned fleets, most operations are the result of contracted efforts. FairLifts is a leader in coordinating helicopter transportation services for the oil and gas production industry in North America, and especially for missions concentrated in the Gulf of Mexico. Helicopter support received through FairLifts delivers an unprecedented level of flexibility for on-demand integrated aviation alternatives. Open water missions and ship to shore transportation is easily achieved with a fleet of state of art helicopter aircraft. Logistical and environmental complexities are managed with confidence by experienced pilots who are adept at responding to the various nuances that have the potential to arise when conducting flight operations in extremely diverse and unpredictable situations. FairLifts is the number one resource for oil and gas production companies in logistical transport, crew transfers, pipeline inspections and remote and portable rig movements plus more. Helicopter missions performed for offshore operations can be complex, to say the least. Despite the constantly evolving variables, pilots and helicopter operators encounter routinely, the environments in which they fly can be equally as diverse and unforgiving. Although the Gulf of Mexico is not the most havoc-wreaking of the various other oil production markets pilots work within, its expanse of open waters should never be taken for granted. Also, the rigs and platforms on which helidecks are installed may be significantly less than stabilized. Having access to experienced operators and pilots can make all the difference in an offshore operation’s potential to succeed. This is where FairLifts serves to deliver a unique advantage to our clients. When you contact FairLifts, the process to request helicopter support for offshore operations is made simple and convenient. FairLifts core objectives lie in delivering quality service at a competitive price that can be achieved with as little imposition to our clients as possible. Customer service is key in developing long lasting partnerships with our clients. When a client initially contacts FairLifts, they are asked to relay the relevant details of their service request. This information will be used to source an appropriate helicopter operator, aircraft and pilot to undertake the objectives of the mission. As the oil and gas production industry rarely complies to scheduled parameters, FairLifts has access to a number of providers who have helicopters available to respond on-demand. Representatives are well versed in the critical elements that serve to deliver successful resolution to a request for service by oil and gas production companies and their counterparts. Agents can additionally provide free service consultations, respond to inquiries, and discuss pricing. In efforts to deliver a quality result via helicopter support for offshore operations, it’s imperative to have established good working relationships with proficient helicopter operators. FairLifts wants to deliver fast, safe and reliable options to our clients so that they feel their company’s best interest is at the center of our endeavors. This is why we source aircraft, operators, and pilots from an extensive pool of globally located operators to ensure that their combined wealth of expertise is at our client's disposal. This translates to our clients never being at a loss for options regardless of how unique or complex their service request is. When working in a fast-paced industry under circumstances that may be less than ideal and flying under comprised conditions, having access to experienced pilots is essential. Specifically for Gulf pilots who are aware that a slight change in the weather could spell disaster for the helicopter they are piloting. Every weather-related eventuality is made more intense offshore as opposed to on which is why piloting skill and a propensity for handling oneself appropriately under pressure are excellent traits to develop in doing this type of work. Not to mention that the various platforms they land upon are often less than underserved with respect to engineered stability, making crew transfers and cargo loading and unloading dubious. FairLifts works with a select group of certified, seasoned pilots who are adept at piloting over open waters, negotiating obstacles on vessels, rigs, and platforms and have no issue with flying into somewhat austere locations. In efforts to highlight FairLifts standard of safety, we will touch upon the various types of helicopter aircraft used in the conduction of offshore operations. As a result of the aforementioned relationships we have worked diligently to establish, FairLifts delivers an array of helicopter-related alternatives. Currently, there are hundreds of helicopters employed in undertakings for the oil and gas production industry in the Gulf of Mexico. Most are FAA Part 135 compliant for in-flight operations of offshore missions, which means they are limited in the number of hours they can safely be utilized inflight The helicopters generally used for open water and Gulf coast operations are turbine powered and a great majority of them are smaller aircraft that are VFR capable. A select few are medium to heavy aircraft and are IFR capable. A few of the specific model types clients may have access to are single pilot Bell models 206 and 407, Twin-Stars, A-Stars, and EC120s. Medium to heavy aircraft are dual piloted and may include Bell models 212 and 412, Sikorsky S-76s, Bell 214STs, and S-61s, respectively. Each helicopter is expertly maintained, are day and/or night instrument flight capable, and are outfitted with emergency flotation for added safety and reliability. Reserve helicopter support for offshore operations. Professional agents are available now to speak with you. Helicopters have proven to be the ultimate resource in offshore operations mainly due to their ease of use, speed,, size and maneuverability These attributes put to use in conjunction with expert piloting skill, experienced operators and a reservations agent who can coordinate it all into one service request makes for an unparalleled combination. Read on to see the different service types we've scheduled professional helicopter resources for. Helicopters in the Gulf are used primarily for these intents. 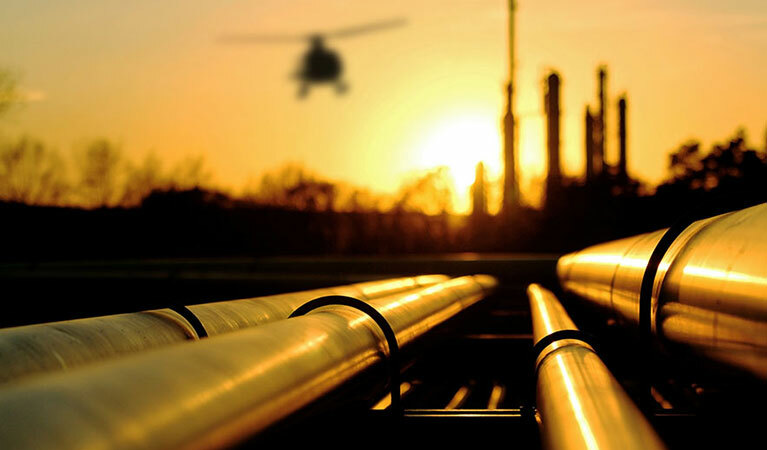 Oil and gas production work is exhaustive, and as such, crews are routinely replenished, The fastest most reliable means of applying crew transfers is via helicopter. Work crews may also need to be delivered to remote work sites and to onshore locations and platforms. Logistical transport may also be reserved to transport senior staff and executives to remote or offshore destinations to conduct inspections or simply as a means of point to point conveyance. Helicopters are utilized to conduct routine inspections of pipelines to search for and isolate areas where lines may be fractured and leaking. Inspections may be flown at lower elevations to scour the area visually to look for inconsistencies in builds, damage to installations, to check for encroachments or to confirm compliance. Pipeline surveys and inspections may also include flyovers in which various types of lasered technologies are used to measure sensored inconsistencies which may indicate a rupture. Helicopters are ideal for rig resupply runs and cargo delivery because of their multiple capabilities. Chief of which is the ability to maneuver into an effective landing on ship decks, oil platforms and drilling rig installations, offshore and in remote areas. Often oil rigs feature a number of obstacles from antennas to cranes that in high winds can prove to be dangerous for any aircraft, The helicopters ability to take off from the precise location of its landing makes it a more effective means over others in the delivery of supplies, replacement parts, and equipment. Working in the most demanding of environments is not for the faint of heart and the trained crew members aboard offshore platforms can sometimes need immediate assistance. Last minute, emergency and SAR operations can be scheduled in a matter of minutes with FairLifts. The pilots we work with are trained to react at the drop of a dime and respond immediately for SAR, medevac and medical emergencies to deliver your crews to and from onshore medical facilities. Get the offshore helicopter commercial lifts and charters you need to reach your offshore oil and gas platforms. FairLifts has the expertise to source a premier resolution to satisfy our client's need for timely, affordable, expertly conducted helicopter service for the support of offshore and oil and pipeline industrial applications. Representatives are available from daylight until dark to speak with clients regarding specific service requests, to talk price and to reserve helicopter support for offshore operations plus more. Simply complete the convenient contact form on our website or place a call to FairLifts.